Finally, FINALLY, we get the story of Mary Whitsun! If you don’t know who Mary Whitsun is, either you’re not a true “Maiden Lane” fan or it’s time to go all the way back to the beginning and start rereading! COVER NOTES: This is likely a gown that Mary wears in the course of the story. Also, that gown is just stunning. LOOK at the fabric in that skirt. BOTTOM LINE: LOVED IT. Mary Whitsun’s long-awaited story doesn’t disappoint! It made me think it’s time to start over with Wicked Intentions and reread the entire series. ON SALE DATE: Available November 14, 2017, in eformats. NEXT UP IN SERIES: The very last “Maiden Lane” entry will be Once Upon a Christmas Eve, available December 5, 2017. I’m going to be devastated when this series is over. 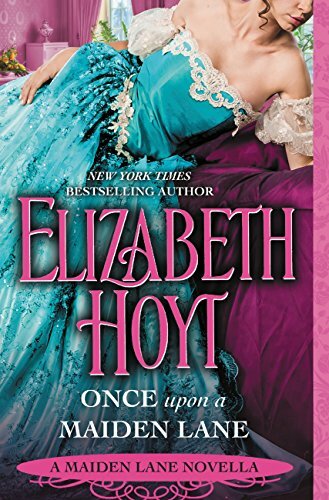 This novella is the second entry in the new “Worth Saga” series, and its characters were first introduced in Once Upon a Marquess (reviewed here). Daisy is Judith’s friend in poverty, and Crash is her former lover. THE PLOT: When Daisy enters a contest that will be awarding startup capital to the person with the best business proposal, the crowd mocks and belittles her. Just because the rules didn’t specifically state the entries must be male doesn’t mean a woman should try to take a job from a man. But when people start throwing things at her, Crash steps in to stop the violence. Daisy and Crash had a brief affair that ended abruptly. She’s not sure why he wants to help her win the contest, but having him around unnerves her. As for Crash, he’s still smarting from their breakup. But as Crash works to build up Daisy’s confidence, they forge an emotional connection that was missing the first time around. MY TWO CENTS: I feel that no one gets to the heart of human emotions like Courtney Milan. For me, that makes her work more than romances. They’re like studies in human nature. The characters learn more about themselves, and that allows them to become romantically involved. I’ve seen some reviews claim that Daisy and Crash had a “big misunderstanding.” I don’t agree with that. A lack of understanding, maybe; but I characterize a “big misunderstanding” as something like: “a couple were in love, but her father told the hero she wasn’t interested, and told the heroine that he only wanted her for her money.” This is more like, Daisy doesn’t understand how she insults Crash by insinuating that he should apologize for who he is…a multiracial former thief of uncertain parentage. In response, Crash lashes out at Daisy, hitting her in her weakest spot: her very worth as a human being. Yep, these two have a lot of work to do to mature, learn about themselves, and other people’s points of view. Also, I love how Courtney is making a point of writing for all people, all kinds of romances. To a lot of people today, an interracial romance is probably no big deal, yet the vast, vast majority of romance is focused on white straight people. Courtney’s got some very interesting stories coming up in her contemporary “Cyclone” series, and I’ll definitely be checking them out. BOTTOM LINE: This novella was just about the perfect length to tell a complete story without getting overly long or being too short. I love the way these characters grow to maturity before they can connect emotionally. TEACUP RATING: Four-and-a-half out of five teacups. ON SALE DATE: The novella is now available in e-formats and paperback. NEXT UP IN THE SERIES: After the Wedding, about Judith’s sister Camilla, should be out around the end of the year.